Winter season is assumed for the booties season and it is around the corner. From the past few decades, this is considered as the hottest trends during the winter season. It is essential to have the right styles and right shape of the booties. Still millions of styles are not able to completely describe this crazy style as these booties come in various styles and design. Generally, it is assumed that it works well with the classic trousers and pants. The big issue for a pair of booties is how to wear them? What to pair them it is very tricky? Here few ways are discussed that may help you understand that how to wear ankle boots or booties with the skinny jeans in a good way during 2018. Tucked– Most pants are not fitted enough from the ankles, to allow this to work with the skinny jeans do tucking of your jeans from the boots that creates a lean, long leg line. This combination is well suited with a pair of booties but with high heel. Rolled Hem– You can pair your booties with the skinny pant that is hem from inward to show off the boots in the best manner. Moreover, this style also allows showing off your skinny area. You will have a cuter look by doing this. Cut the Hem– To show off the booties, cut the skinny denim at the perfect length. For the unintentionally distressed finish leave them un-hemmed. Cuffing– To have a smart look with the pair of booties for this best way is to cuff the skinny jeans from the bottom. Larger the cuff the more pleasing look you will have. Layering Leggings and Socks– Layering may add the bulky look to the ankles but this is best to wear in winter for a cute look. Combine your booties with the natural color socks and socks length should be medium. Avoid layering of the socks over the jeans it will give a very bulky and tacky look to the ankles. Monochromatic– Another pleasant way to wear your booties with the skinny jeans is to have a monochromatic look. So pair booties with the matching denim. This is the best way to make your legs longer and leaner also goes well with the high-heel booties. 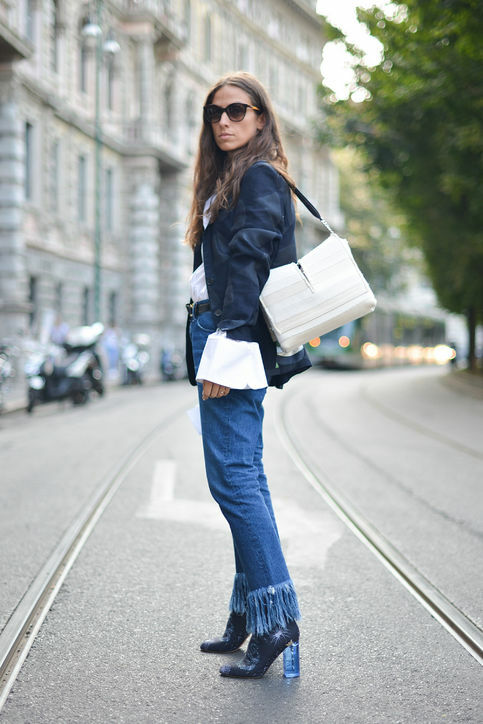 Half Cuff– This is one of the favorite ways of most of the girls that to pair your booties with the half cuffed denim. This look does not take any effort and becomes fabulous when paired with sunglasses and oversized tee. These all pictures are available here to shows just outfits and matching booties in case of any copyrights please mention in comment box they must be removed.